There isn’t much point in showing another picture of the wedding shawl because it looks pretty much the same as before: a big blob. A very pretty blob, but a blob nonetheless. I’m also now 95% certain that I will not have enough yarn to complete the knit-on edging. 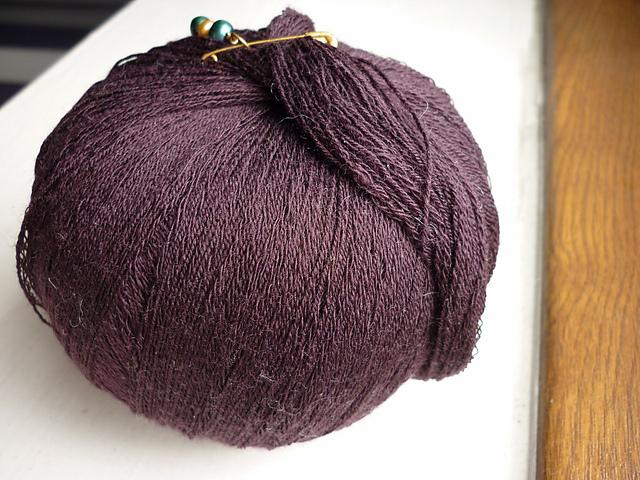 I’ve been stash diving and came up with a really pretty dark purple that I think will work nicely as the edging. And the beads will really pop! The wedding shoe hunt continues. I thought I’d found some good options, but nope. Why do shoes look great online but are a disappointment in person? One of the The Irregular Choice pairs looks rather tacky and the other one… well, they seemed okay. But I’m not going to spend £75 on a pair of shoes that I’m not absolutely in love with already in the shop. So today I went to New Look to try on a pair I’d seen online. They’re an option to keep in mind if I’m going to embellish the shoes myself, but really, I think I’d rather just pay a little bit more and get a nice pair that I won’t have to do anything to. This entry was posted in Knitting, Personal and tagged knitting, wedding. Bookmark the permalink.